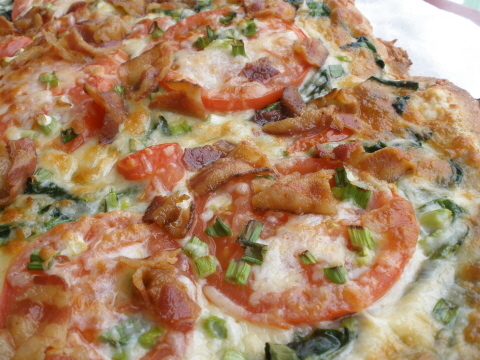 I can think of nothing more wonderful that combining two of my favorite things; BLTs and pizza. This was absolute divinity. The green onions gave it an extra bite, and it came out beautifully, if I might be so bold. Preheat oven to 500°. While the oven is heating shape your dough into the desired shape, adding as little flour as possible. Poke several small holes in the crust with a fork to prevent bubbling. Transfer pizza dough to whatever, pan, stone, etc you will be using for cooking. Brush crust with a bit of extra-virgin olive oil, and cook without toppings for about 5 minutes. Add cream sauce and spread evenly. Then add spinach, tomatoes, green onion, mozzarella, and parmesan. Cook for 10 or so minutes more, or until golden brown. Sprinkle bacon over cooked pizza.